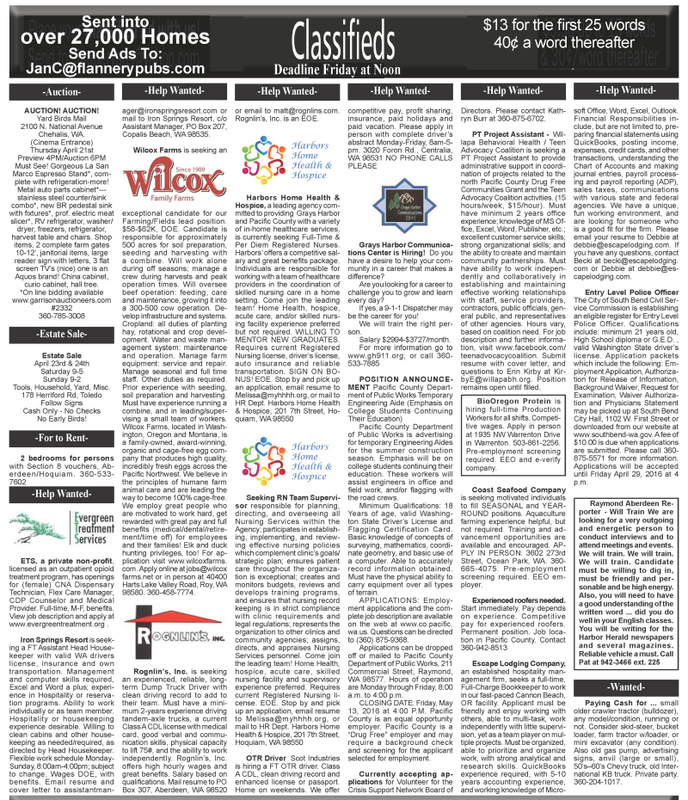 Showing 18 articles from April 19, 2016. The Washington Coastsavers will be holding a beach cleanup on April 23 starting at 9am and going until 1pm. You can check at www.coastsavers.org/index.php/cleanup/ for a map of specific beaches in Washington that the Coastsavers will be at. Impress With Dress Bridal Shop has been in the downtown of Aberdeen since November 17, 2014 and have since expanded the store. Owner Linda McLaughlin came to the area from an ex-marriage, and ended up staying, "When I was in my twenties I had my own design shop in Ventura California and so fashion has just been in my blood. Before that I worked for the state for over twenty years as a social worker," said McLaughlin. "We're doing good and we've expanded to where we have over 150 wedding dresses, where we started with around four or five dresses," said McLaughlin. The shop has added a bridal room since opening, and they have about 2600 square feet of floor space. "We have all the sizes of clothes from casual to the most elite. We now have a new pet wall where we have a few little toys and treats and things," said McLaughlin. The 7th Annual High Rollin Hot Rods at the Beach will be held on April 22 at the Great Hall in Ocean Shores. 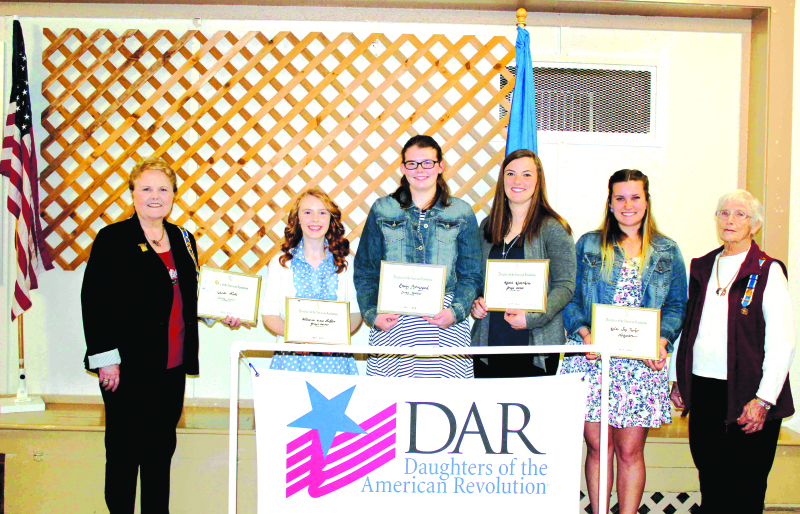 Each year the National Society Daughters of the American Revolution, Robert Gray Chapter, offers a $500.00 scholarship to a High School student from our local community. This award was created in 1934 as the DAR Good Citizenship Pilgrimage, because the state winners, Senior Girls from four-year high schools received a trip to Washington, DC. In 1952 the name was changed to DAR Good Citizens Committee and monetary awards were presented to winners. The Grays Harbor PUD's proposed rate restructuring has called some customers to question the PUD's actions. The PUD is to delay voting on the issue, due to public outcry. The Toledo city council and Winlock city council have taken steps toward making communities aware of the importance of the month of April. The governments of both cities have signed declarations brought to them by Amber Buck of the Board of Human Resources, urging citizens to be aware and alert when it comes to sexual assault. Every 107 seconds, an American is sexually assaulted. Roughly 293,000 Americans are sexually assaulted or abused every year. Teens and preteens are the most vulnerable. 44% of victims are under the age of 18, making up the largest age block. 80% of victims are under the age of 30. If you are or have been a victim of sexual assault, the Board of Human Resources is designed for you and will help you. On Friday, April 15th, Winlock high school students and the 8th grade students sat in silence and in thought throughout most of the day. To begin, they sat in the middle school and watched a video of their classmates at a "party" and saw them get into a car after drinking. The car began to swerve and then the video cut to black, which followed with the infamous question: "What did I just do?" 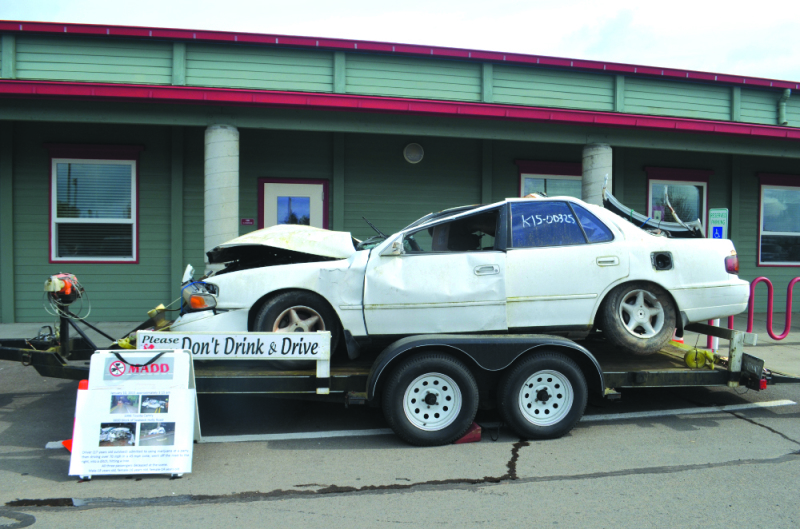 The story behind this mock DUI crash was students went to a party, chose to drive after drinking, and then one student got behind the wheel with three other passengers and struck another car with a mother and two small children. Judges, defense attorneys, and attorneys of the state from the Lewis County Prosecutor's Office were also present during the "trial" and sentencing of the student who drove under the influence. A mock funeral was held where close friends spoke about the life of the deceased, the older sister of the two girls killed sang a song, and the student who was the drunk driver spoke and apologized for his actions. The emotions were very real, though the car crash was fiction. In honor of Earth Day, Washington State Parks and Recreation Commission is offering a free day at all state parks on Friday, April 22. Visitors will not need to display a Discover Pass for day-use visits to state parks. Photo by Nolan Patching - Toledo's pitching ace Wes Kuzminsky delivers a pitch in the fourth inning against Winlock. Kuzminsky allowed two runs on three hits and struck out seven, paving the way to an Indian win. Toledo baseball continued their streak of league dominance with convincing 14-1, 12-4 wins over the Winlock Cardinals. The Indians scored 11 of their runs in the fourth and fifth innings, five in the fourth and six in the fifth, to end the game early in the fifth inning. The Indians also held Winlock to just one hit, a single by Brady Steveson in the first inning. Steveson was also Winlock's lone scorer in game one. Jackson Kuzminsky started on the mound for the Indians and pitched the entire game, only allowing the one hit and run and striking out five. Jake Anderson started for the Cardinals and pitched well for the first three innings, according to coach Scott Weinert. Connor Vermilyea led the Indians in game one going 3-4 from the plate. Jackson Kuzminsky, Wes Kuzminsky, and Dakota Robins each picked up two hits in the game. Photo Courtesy Chief Deputy Pat Matlock - Deputy Steve Ross (left) is awarded his diploma by Pacific County Sheriff Scott Johnson. 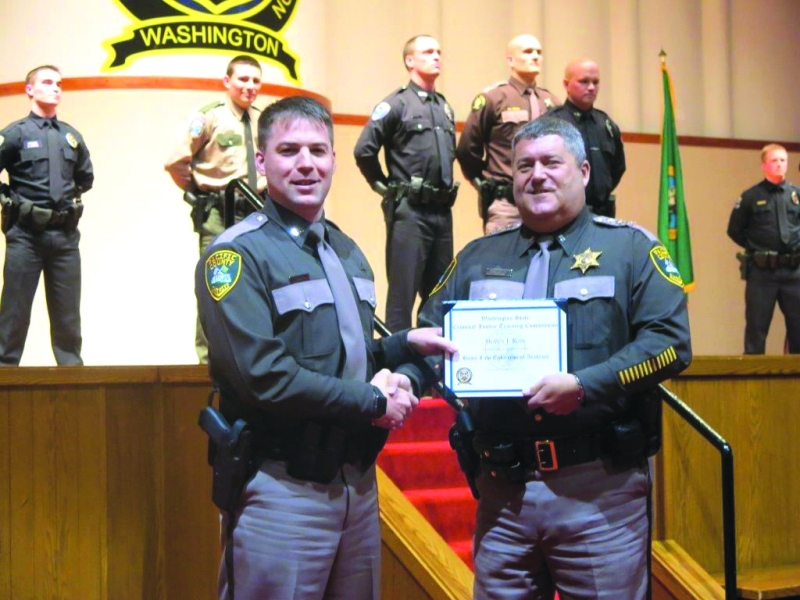 Deputy Steve Ross graduated from the WSCJTC Law Enforcement Academy on April 12th in front of a large crowd of fellow law enforcement officers, dignitaries, family and friends. Police responded to a report of a stranded dolphin that had been injured but was alive, around 8pm on April 10. This species of dolphin was not usually seen in this area was beached to the south of Seaview. Photo by Larry Bale - South Bend High School Drama presented "Just Another High School Play" Friday and Saturday at the Hannan Play House in Raymond. A small cast and crew of all girls played multiple parts to the amused satisfaction of the audience. Photo Courtesy JoDean Jordan - Elixir Café and Floral Design hosted the first Paint and Sip on the Willapa to benefit Crime Victims Awareness. 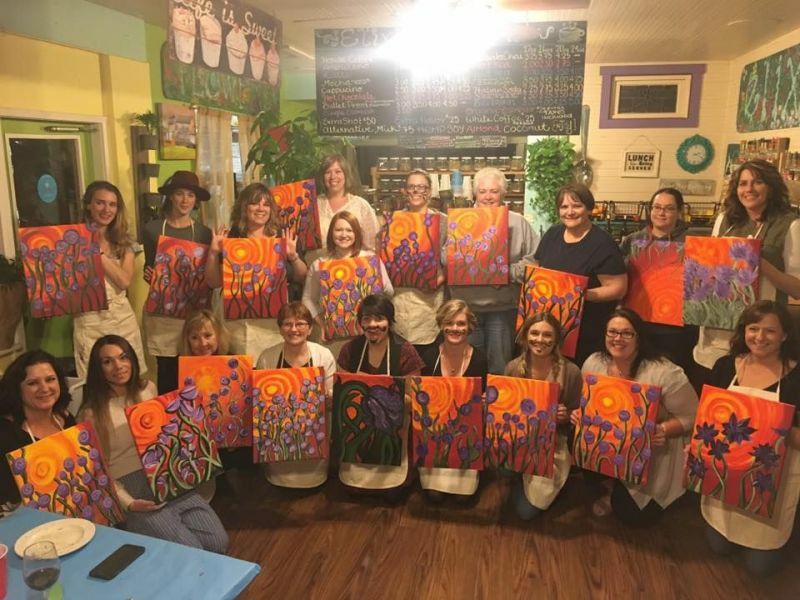 Elixir Café and Floral Design hosted the first Paint and Sip on the Willapa April 9. The event was organized by Sam Stephens, Rachel Stanton, and JoDean Jordan. The Raymond City Council met Monday, April 18 for their regular bi-monthly meeting, which the council started with the pledge of allegiance. Mayor Dunsmoor and Chief Spoor were absent from the meeting, and the council chamber was at maximum capacity for the members of the public. After the usual business of approving the minutes from the previous meeting the council heard from the public. 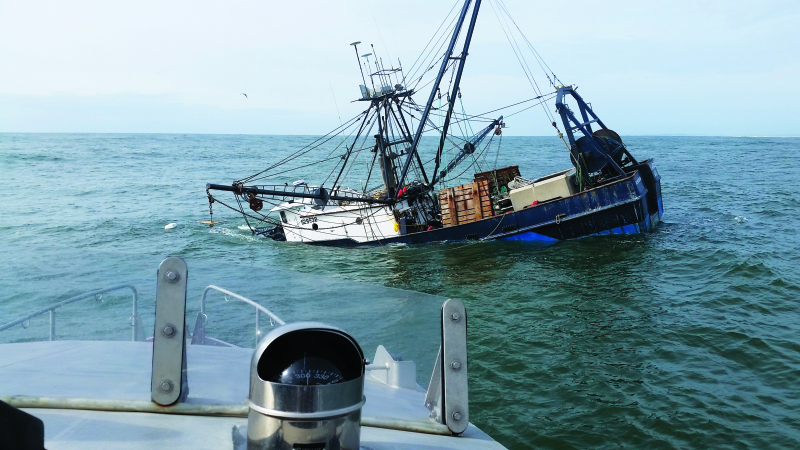 Photo by U.S. Coast Guard Petty Officer 2nd Class Jacob Hylkema The 74-foot fishing vessel Privateer sinks approximately one mile north of Grays Harbor, Wash. April 15, 2016. The Oil Spill Liability Trust Fund was opened to assess the salvage. GRAYS HARBOR - A Coast Guard boat crew rescued three fishermen after their vessel took on water and sank less than one mile outside of Grays Harbor. Timber Grounds located in downtown South Bend. A new coffee shop has sprouted in downtown South Bend. Local Pacific County Deputy Jesse Eastham and his mother have opened a shop as a sort of "business venture." The shop is open from Monday to Friday from 5:30am to 6pm, and on Saturday and Sunday from 7am to 5pm. Street trees are vital to our city environment, without them the city is a sterile landscape of concrete, bricks and asphalt. Think of Raymond without any trees and you see a pretty grim picture. A town that people passing by won't stop in because it looks like there is nothing to see. Simply having street trees and human scale lighting give it character and charm that is inviting to the eye and soul.